Voice Alert System-6 is a new annunciator system featuring wireless PIR sensor transmitters and a remote receiver/speaker base unit. Users record their own alert messages and are then notified with their own voice message when activity in a monitored area is detected. A passive infrared (PIR) sensor is a special type of sensor used to detect body heat generated by humans and animals. This heat energy is compared to the temperature in the area where the sensor, or the device containing a PIR sensor, is mounted. In home security devices, each time a PIR sensor detects a significant change in a nearby object’s infrared or heat energy in relation to the rest of the room or environment, an alarm is triggered. = Home Automation System-6 allows a maximum of six user recorded messages. = Each message is specific to one zone. = Includes the base unit & a wireless sensor. System-6 allows a maximum of six user recorded messages. Each message is specific to one zone. For instance zone one could be for a driveway alarm -“Car coming up the driveway” while zone two could be for a sensor monitoring the back yard- “Alert! Child by the pool!” Perhaps a third sensor guards a side entrance against intruders. However when this PIR detects movement the base unit plays “Intruder on patio” and triggers a floodlight using one of four relays included on the base unit. 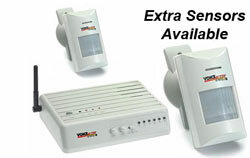 System-6 can monitor all three zones simultaneously and still have three additional zones available when needed. Users can alter their messages and place the wireless sensors wherever they wish. Voice Alert System-6 sets up in minutes and can be completely customized to fit their individual needs. The wireless PIRs feature: all weather protection adjustable mounting and sensitivity and can send a signal 300 feet through walls and up to 1000 feet in open space. You may add transmitters to cover as many areas as you want. This Voice Alert System 6 can be delivered in 3 to 5 business days. If you would like to receive your order sooner, guaranteed 3 day, 2 day and next day delivery options are available upon checkout. Orders placed by 2:00 PM central time ship the day they are placed. If you have any questions or concerns call our customer support staff at 800.960.2015 or click the live chat button at the bottom of this page. Our courteous and professional customer support team is always glad to help!